The newest pet to grace Celtic Heroes is the ultra-rare dragon pet. This tutorial will give you more information about it, how to get one, how to train it, and answer some frequently asked questions. Mystery chests. When you open a mystery chest you have a very slim chance to win the jackpot prize; 4000 platinum, 2 million gold, and now one dragon egg. 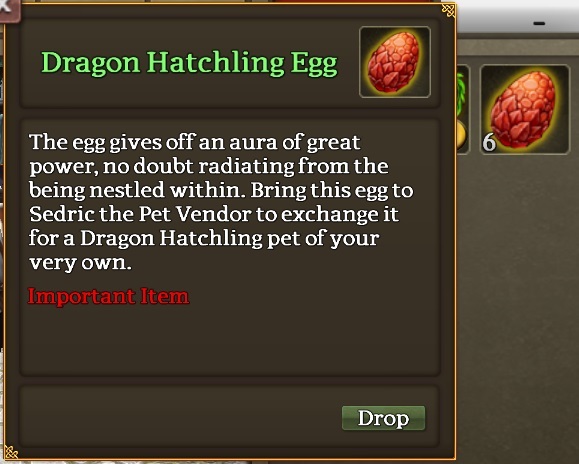 This dragon egg will get you a dragon when you turn it in to Sedric the Pet Vendor in Farcrag Castle. So 1 dragon egg is as rare as getting 4k plat, or the 2m gold prize. Remember, like all other pets you need to feed dragon food to your dragon to make it active. How do I breed one? Breeding dragons is unique. You need one dragon egg per upgrade. You upgrade it by taking your egg, and your small dragon to Elva the Pet Breeder. For each subsequent upgrade, take your egg and the dragon to Elva. The max tier dragon is 6. What types of dragons are there? What are the stats on each tier of dragon? How do I get the Draconic Attunement Skill? Talk to Druid Robina the Pet Ability Trainer in Farcrag Castle and choose the Draconic Attunement quest. Increasing your Draconic Attunement will increase the damage your dragon's skill will do. What Dragon should I get? Black magic dragon for anything Tower and above. Everything before the tower has a lower poison resistance. Everything in the tower has a higher poison resistance. Poison has the highest base damage skill out of the dragons, but will actually cause less damage than if you use a max lure from a Mage. It also depends on mob resistance. How likely is it that I'll get a dragon? It's a jackpot item, so it's not likely. Some people got one out of 10 chests, others got none out of 3000. I opened 760 and got one. Are Dragon Eggs Permanent or Temporary? Muldar: "The Dragon Pet is at this time permanent content, not seasonal. (If this changes players will be notified in advance)"
I accidentally bought two level one dragons! How can I get a level 2 one now? Send an in game support ticket describing what happened, your character, and your world. Someone from OTM support should be able to help you. Does the tic damage on the DoT have a chance to crit? No. Muldar said: "The tic will not crit, if we were to add this the skill would require a re-balance." Does the tick damage on the dragon skill increase the dragon ability? No, it doesn't. Only the initial cast will the tics on the DoT will not. Is Celtic Heroes pay-to-win now? Answer unclear. To some it is now, but to others it's not because you don't need the dragon pet to advance. See the Celtic Heroes forum for more opinions. When was the dragon pet released?